Autumn has definitely arrived here in England and I for one LOVE the season. 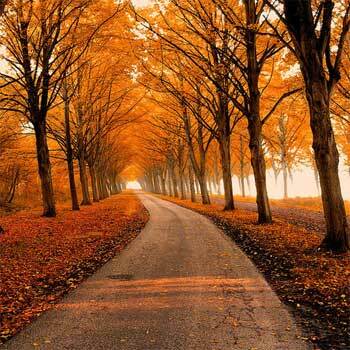 1) The dramatic burnt orange, golden and red leaves on the trees is breathtakingly beautiful and it always manages to impress me with its vibrant hue. 2) Kicking the crisp fallen leaves as you walk gives us all – old and young alike – that inner thrill. 3) Roaring fires to warm up by whilst drinking hot chocolate or warm apple cider. 4) Big warm jumpers to keep us roasty toasty. Everyone looks great in autumn fashion. 5) Harvest Festival, Bonfire Night, Halloween and everything that is associated with them. 6) Hearty comfort food such as casserole, stews and soups become regular staples. 7) The smell of woodsmoke – it has to be one of my all time favourite smells. 10) Making chutneys, pickles and preserves. What do you like most about autumn? Don’t be shy, leave a message below. 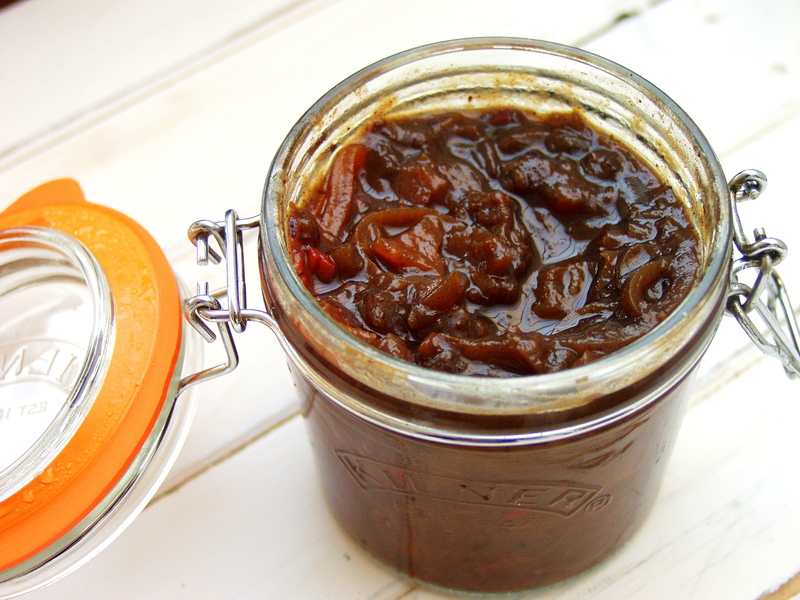 Last year I cooked a huge batch of Kashmir chutney and sweet piccalill which made great little christmas gifts and recently I decided to make some pickled peach and chilli chutney. 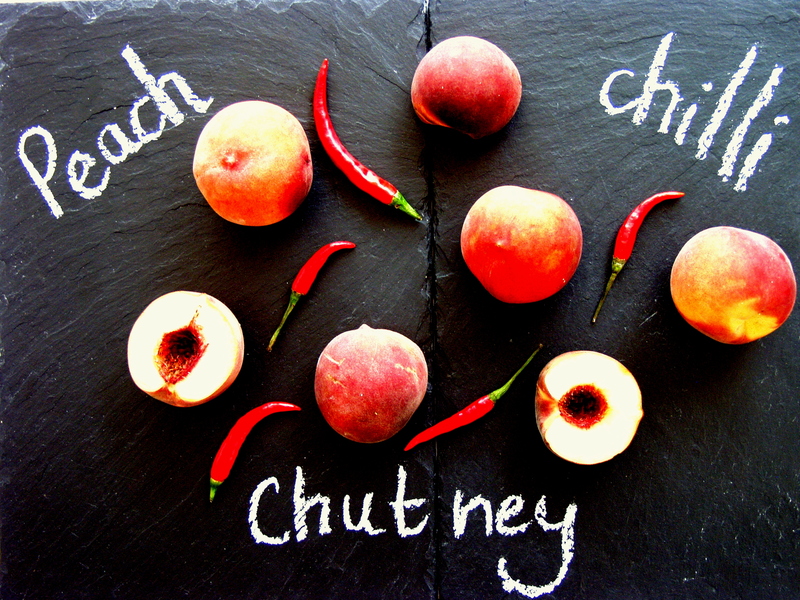 They were selling huge batches of peaches at the market so I thought that they would be perfect for this chutney. I tend to make double the portions of the amounts below as they last for up to 6 months so are easy to keep and store. 1. In a large pan place the vinegar, dates, sugar, allspice and mace and gently heat. Stir with a wooden spoon until the sugar is completely dissolved. 2. Bring to the boil and then add the peaches, sliced onion, chopped chillies, crushed garlic, grated ginger and salt continuing to stir occasionally. 3. 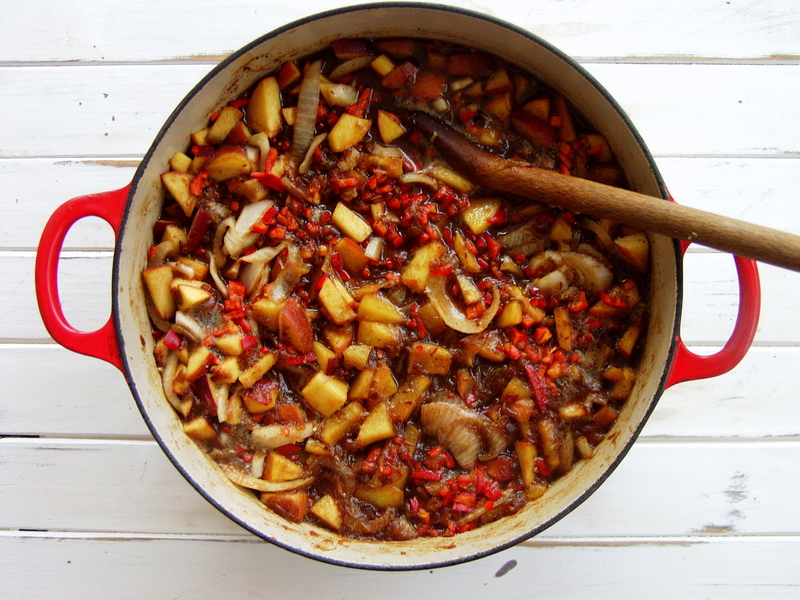 Reduce the heat and simmer for 40-50 minutes – by which time the chutney should have thickened. 4. 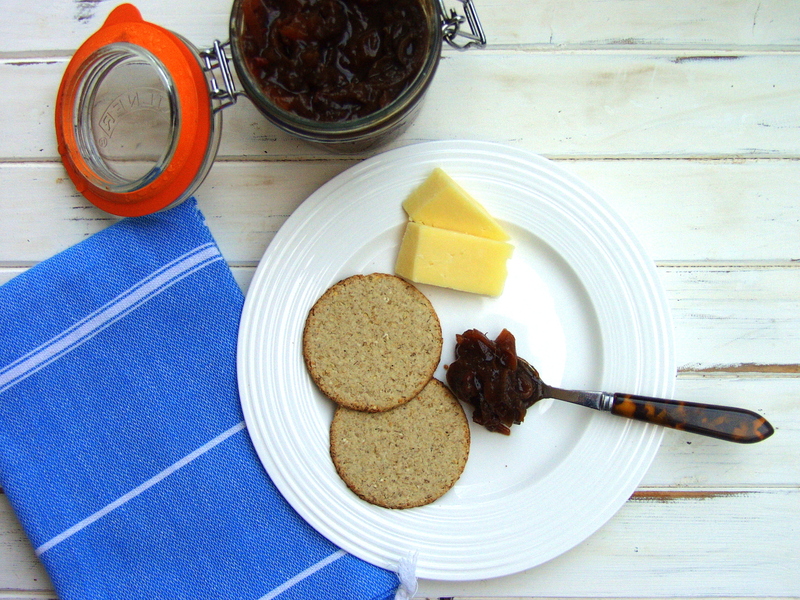 Spoon the hot chutney in steralised jars – either by boiling them in water first or putting them in the dishwasher. I place a waxed disc on top – waxed side down and then place the lid on top. You need to store them in a cool, dark place where the chutney can mature for at least 2 weeks before eating. They will last up to 6 months. Another great way to eat the chutney is with grilled chicken served in warm wraps or with ricotta or goats cheese and some crusty bread. This entry was posted in Chutneys, Vegetarian and tagged autumn, chutney, garlic cloves, light muscovado sugar, onions, peaches, red chilli, root ginger. Bookmark the permalink.